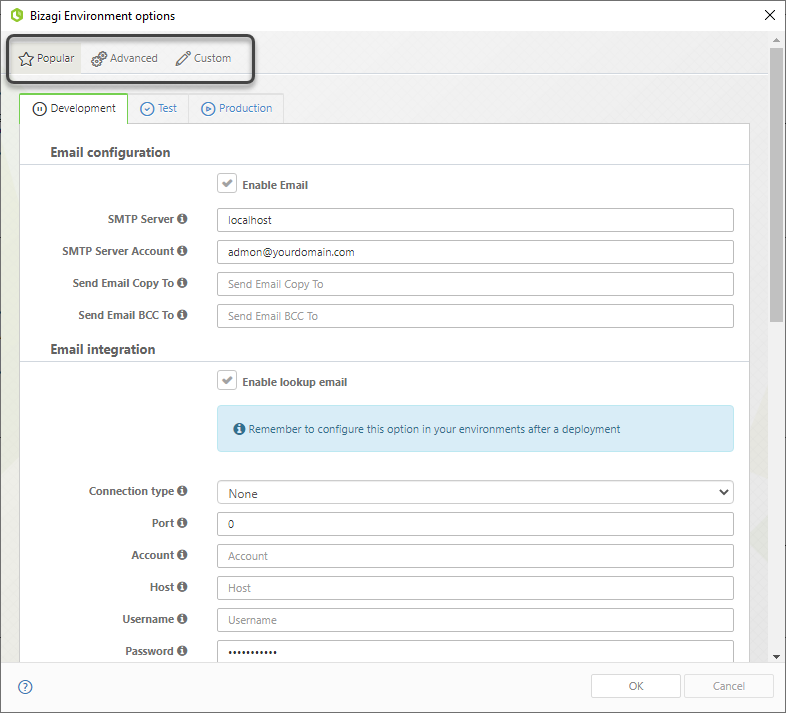 The environment configuration determines the way in which sending email, the Scheduler, uploads and logging options are configured. This option is found in the Configuration Tab in the Management Console. 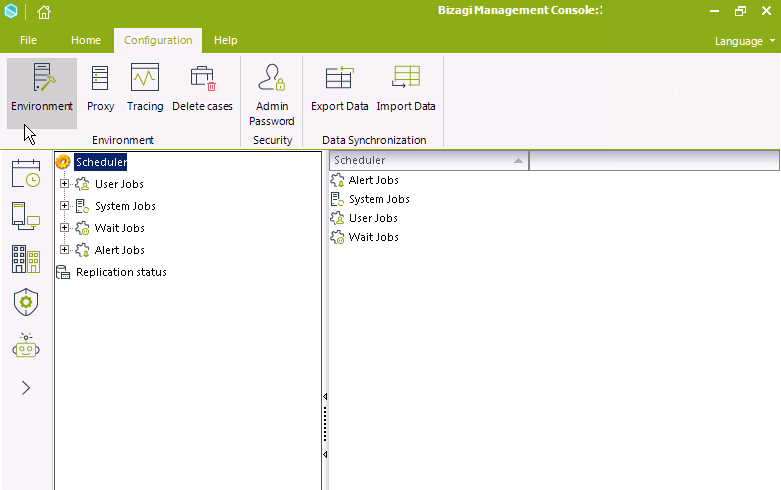 Before the first deployment, you configure ALL environments in Development in the Bizagi Studio. The first deployment take the configuration to each environment. 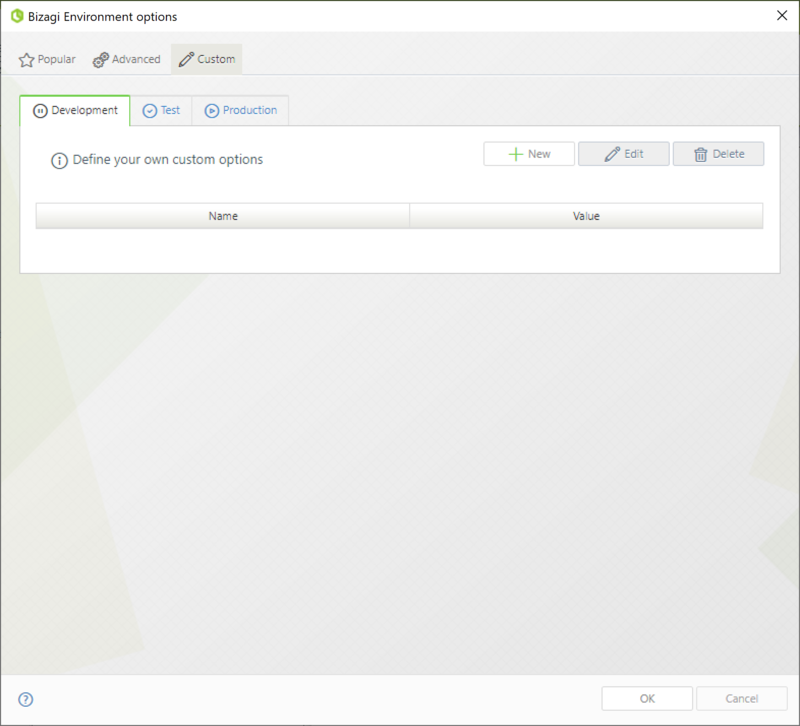 After that, make changes to Environment Configurations using the Management Console for each environment. If you want changes to be a permanent, part of the process design, make them in the development environment as well. 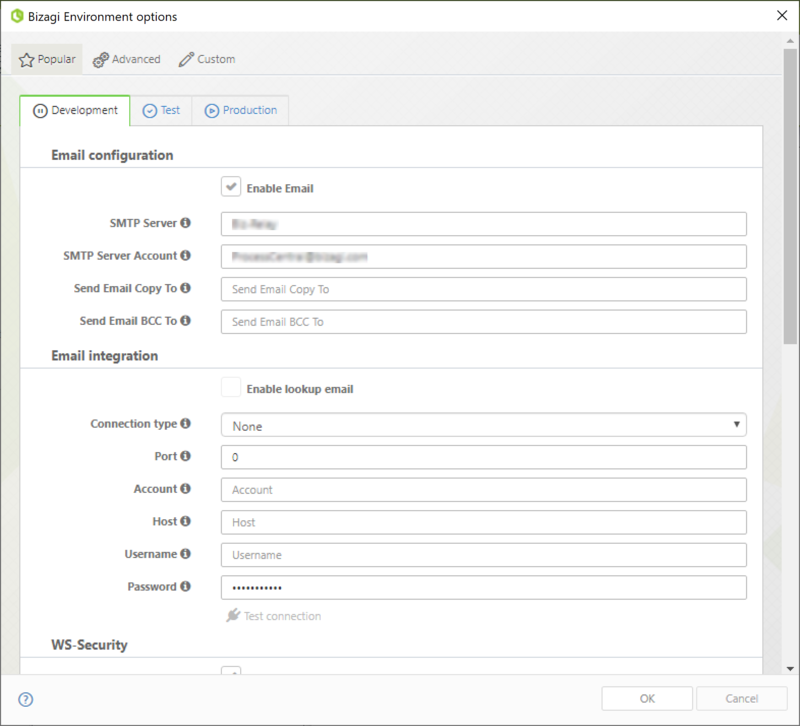 From this option you can configure the parameters for sending email for each environment (Development, Test, Production). Allows Bizagi to send emails, or prevents it. Select this option to permit sending e-mails. If it is not selected, emails will be ignored. Defines the name of the SMTP server. The SMTP can be local (localhost) for specific testing purposes in the Development environment. For Testing and Production environments the server must be the company's server from where e-mails are sent. Defines the SMTP account (or address) used to send e-mails. It must be a valid e-mail address on the SMTP server. If the local server (localhost) is used, the e-mail address may be a non-valid one. If a real SMTP server is used, the address must belong to the domain. Enables the possibility to retrieve emails from the configured account and Complete tasks via email, without entering the Work Portal. Depending of your company's requirements the available options are Exchange, POP3 and IMAP. Defines whether Bizagi uses SSL to connect to your server. We recommend that you enforce use of SSL. This option depends on your Mail Server configuration, and it is available when the connection type is POP3 or IMAP. Exchange connections already enforce the use of HTTPS. Defines the account that will receive email replies sent by end users. Defines a valid user name within your mail server to perform the connection. We recommend using an exclusive account to retrieve incoming messages for email integration. Bizagi will read all incoming messages and will mark them as read. For traces and troubleshooting, errors are recorded in the Window's Event viewer. From this option you can configure the parameters of Advanced features for each environment (Development, Test, Production). Configures how often (in hours, minutes and seconds) the Scheduler service checks whether there are pending jobs. Define the physical Directory where files uploaded by the client are stored. The value for this property may be a local folder or an external path to a location on a remote server. For remote servers, the path must be \\[IP Address or Server Name]\[Folder]\. Make sure you have write permissions on the folder in the server. The default directory in Bizagi .NET is C:\BizAgi\Projects\[Project name]\Docs. Defines the maximum allowed size in bytes of files to be uploaded. The option to un-select this checkbox, is available for Bizagi .NET. If selected, and you use the SOA layer, Bizagi displays an exception when attempting to register a business key pointing to either a parameter or master entity that does not exist in Bizagi. If the option is not selected the business key is saved as null. Parameter entities in the Work Portal are handled in Cache if the number of attributes in the entity is less than the first parameter AND the number of records is less than the second parameter. Parameter entities that have more attributes or more records than the thresholds will be loaded on demand (accessing the DB). These parameters refine the application's performance when there is a large volume of data. 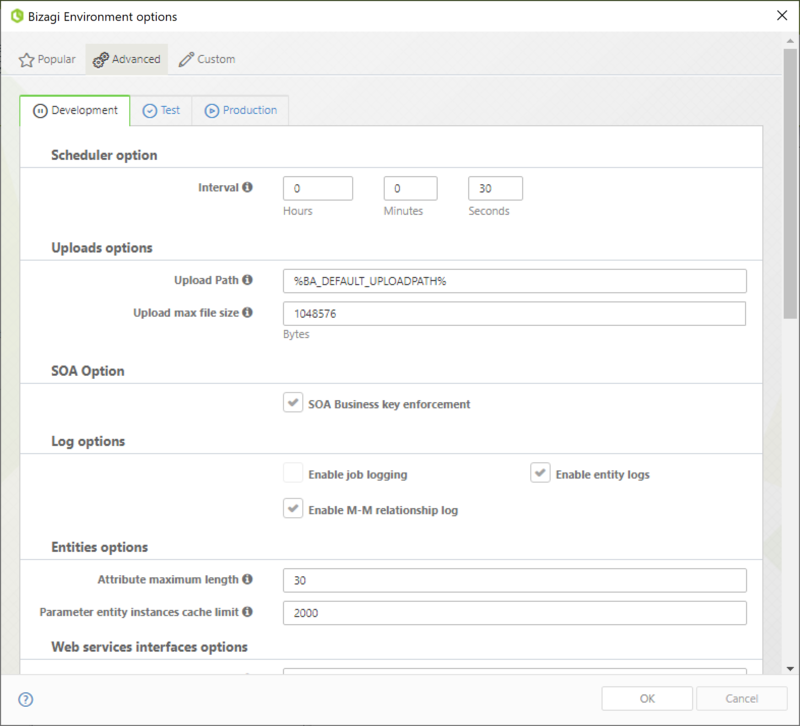 Configure a timeout for synchronous Web Services. If the value specified is less than or equal to zero, it is ignored, and Bizagi waits for a reply with success or failure, no matter how long it takes. Since this can cause blockages we suggests setting a value. Bizagi logs interfaces that last more than this time. When this option is selected the Stop notifications will not be sent. Stop notifications are sent to all users who have pending tasks in a case that is canceled in the Work Portal. ODS (Bizagi Operational Data Store) is an optional mechanism that improves Bizagi server's overall availability (enhances performance and reliability as well). Here you can see project parameters for the different environments. To guarantee correct performance of all environments, Custom Parameters cannot be edited or deleted once they have been deployed.